K9 Granola Factory’s Green Bean Chips are dog treats that are loved by all. They are the perfect light, healthy snack for dogs on the go. These dehydrated chips contain only four ingredients, making them a simple yet delicious treat. 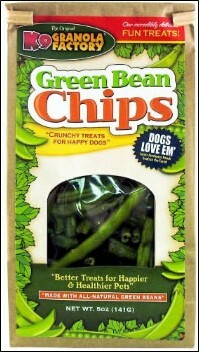 Green bean dog treats provide the benefits of green beans in a portion-controlled snack. Green beans are sometimes recommended for dogs who need to manage their weight, as they are high in fiber and low in calories. Green beans also provide iron and valuable vitamins for your dog.